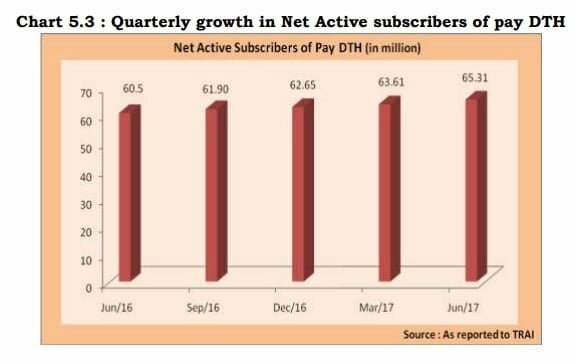 The number of active paying DTH subscribers has jumped to 65.31 million for the quarter ended 30 June as against 63.61 million in the preceding quarter ended 31 March, as per data provided by private DTH operators to the Telecom Regulatory Authority of India (TRAI). The data is only for pay DTH operators and excludes DD Freedish, the free DTH service of Doordarshan. TRAI has stopped reporting the total DTH subscriber base, which also includes the inactive subscriber numbers. 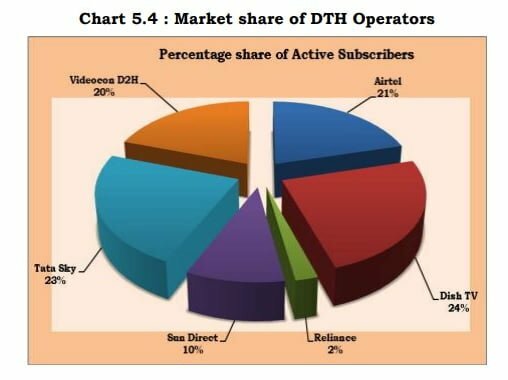 In terms of market share, Dish TV leads with 24% market share of total active subscriber base, followed closely by Tata Sky (23%), Airtel Digital TV (21%), Videocon d2h (20%), Sun Direct (10%) and Reliance Digital TV continues to trail behind with a mere 2% of the active subscriber market share. As far as channel carrying capacity is concerned, Tata Sky reported the maximum number of pay + FTA channels at 577 channels. Sun Direct carried the least number of pay + FTA channels at 263. Among multi-system operators (MSOs), Siti Networks reported maximum pay + FTA + local channels at 420. GTPL Hathway carried the least number of pay + FTA + local channels at 200. It is worth noting that Dish TV is currently in the process of merging its DTH operations with Videocon D2H for the formation of Dish Tv Videocon, the company which will lead the sector with a lion’s share of subscriber market share of 44%. Also, the struggling operations of Reliance Digital TV may soon be closed down as the parent company is in a process of structured debt reduction and closure of non-core businesses, this is further hinted at by Sun Direct ending its Transponder sharing agreement with Reliance Digital TV and moving all shared channels from RDTV to its own transponders. Whenever I see Esmail is writing something , then I just read the article twice . Its always going to be full of information and knowledge . Thanks a lot . i haven’t watched TV since last 5 years and not recharged my dth since last 2 years. not missing out on anything at all rather life feels better and fruitful.